The Darnhill estate near Heywood, Greater Manchester was built by Manchester Corporation between 1947 and the 1960s as overspill housing. 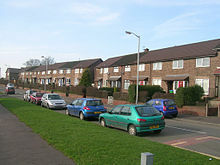 An overspill estate is a housing estate planned and built for the housing of excess population in urban areas, both from the natural increase of population and often in order to rehouse people from decaying inner city areas, usually as part of the process of slum clearance. They were created on the outskirts of most large British towns and during most of the 20th century, with new towns being an alternative approach outside London after World War II. The Town Development Act, 1952 encouraged the expansion of neighbouring urban areas rather than the creation of satellite communities. Slum clearance tenants often had problems with the move, since it separated them from extended family and friends, needed services were often lacking, and only the better off workers could afford the extra cost of commuting back to their jobs. Another criticism was that the new estates occupied what had been productive agricultural land. ^ G. C. Dickinson (April 1962). "Overspill and Town Development: In England and Wales, 1945-1971". The Town Planning Review. 33 (1): 49–62. JSTOR 40102328. ^ H. R. Parker (January 1956). "A Change in Housing Policy". The Town Planning Review. 26 (4): 211–14. JSTOR 40101578. ^ Michael Mann (1973). Workers on the Move: The Sociology of Relocation. Cambridge Studies in Sociology. 6. Cambridge: Cambridge University Press. p. 20. ISBN 9780521087018. ^ Peter Shapely (February 2006). "Tenants Arise! Consumerism, Tenants and the Challenge to Council Authority in Manchester, 1968–92". Social History. 31 (1): 65. JSTOR 4287297. ^ a b J. Barry Cullingworth (2016) . Housing Needs and Planning Policy: A Restatement of the Problems of Housing Need and Overspill in England and Wales. London: Routledge. p. 163. ISBN 9781138972025. This article related to the politics of England is a stub. You can help Wikipedia by expanding it.